When picking a dental office, choosing one that can help you and your entire family is important. For one thing, you want your little one to see a dentist you already know and trust. But convenience is also important. Being able to schedule back-to-back appointments for yourself and your child will make it easier to make regular care a priority. At Robison Dental Group, we’re happy to help adults and children alike with their important dental health needs. To do that we offer our Canton-area patients general dentistry (including orthodontics), cosmetic dentistry, and restorative dentistry. How often should you and your child see Dr. John Robison or Dr. J.D. Robison? We recommend coming in every six months instead of just when you have a symptom you want us to check out. Common issues like tooth decay and gum disease do have symptoms, of course, but sometimes a serious issue can develop without any symptoms at all. With regular care, Drs. John and J.D. Robison can help your entire family enjoy better overall health and wellbeing, and provide early treatment for common issues if needed. To deliver excellent care, we use several revolutionary technologies. One of those, DIAGNOdent, helps our Canton team detect decay very early on, before a visual exam would even catch it. Another early-detection tool, VELscope, helps us identify oral cancer. As with so many other oral health issues, treating oral cancer early is important. These high-tech tools are making care more comfortable but also more thorough. 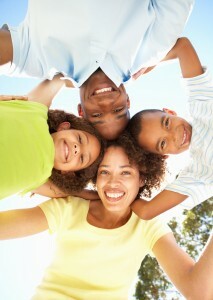 We will assess the current health of you and your child and come up with a treatment plan to help. Don’t put off important dental care. Call Robison Dental Group today to schedule your next appointment with a dentist. We serve patients from Ann Arbor, Northville, Westland, and Plymouth.